This article introduces the concept of using content types to manage your content. 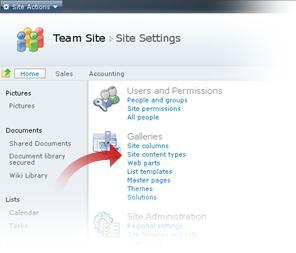 Note: To create or manage a site content type on a site, you must have at least Design permissions to that site. In the course of a single project, a business might produce several different kinds of content, for example, proposals, legal contracts, statements of work, and product design specifications. A business might want to collect and maintain different kinds of metadata about each kind of content. Metadata might include an account number, project number, or project manager, for example. Although documents might be stored together because they are related to a single project, they can be created, used, shared, and retained in different ways. Content types enable organizations to organize, manage, and handle content in a consistent way across a site collection. By defining content types for specific kinds of documents or information products, an organization can ensure that content is managed in a consistent way. Content types can be seen as templates that you apply to a list or library and you can apply multiple templates to a list or library so that they can contain multiple item or document types. The columns (metadata) that you want to assign to items of this type. The document template that you want to apply to new items (available for document content types only). Custom New, Edit, and Display forms. The workflows for items of the content type. There are two kinds of content types that you can create or use depending on whether you want to use them in lists and libraries across multiple sites in a site collection, or in a specific list or library on a single site. Site content typesContent types are first defined for a site in the Site Content Type Gallery. Content types that are defined at the site level are called site content types. Site content types are available for use in any subsites of the site for which they have been defined. For example, if a site content type is defined for the top-level site in a site collection, it becomes available for use in lists and libraries across all sites in that site collection. List content types Site content types can be added individually to lists or libraries and customized for use in those lists or libraries. When a site content type is added to a list or library, it is called a list content type. List content types are children of the site content types from which they are created. List content types can make your document libraries and lists more flexible, because a single list or library can contain multiple item types or document types, each of which can have unique metadata, policies, or behaviors. In order for a list or library to contain multiple item or document types, you must configure the list or library to allow multiple content types. The New command in that list or library then lists the types available for that list or library. You never create content types from scratch. Instead, you are provided with a default set of content types which you can use as-is or customize. Content types are organized into a hierarchy that allows one content type to inherit its characteristics from another. This structure enables you to handle whole categories of documents consistently across your organization. The tables below describe each base content type and their related group and parent content type. All content types inherit from the System content type. This content type is sealed and cannot be edited. Upload an image or photograph. Create a form that can be filled out. 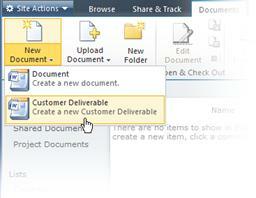 Create a link to a document in a different location. Used for the Dublin Core metadata element set. Dublin Core Columns are an industry standard metadata definition for documents. For more information, see Dublin Core Metadata Initiative. Create a new meeting, deadline or other event. Schedule and reserve a resource. Reserve a resource, such as a meeting room. Track an issue or problem. Create a new blog comment. Create a new list item. Store information about a business or personal contact. Track a work item that you or your team needs to complete. Create a new blog post. Create a new news item, status or other short piece of information. Create a new link to a Web page or other resource. Add a new word to the list. Add a new official notice. Add a new phone call memo. Add a new resource group. Add new users to the list. Create a new discussion topic. Group and describe related tasks that you or your team needs to complete. When you define a new custom site content type in the Site Content Type Gallery for a site, you start by selecting an existing parent site content type in the Site Content Type Gallery as your starting point. The new site content type that you create inherits all of the attributes of its parent site content type, such as its document template, read-only setting, workflows, and columns. After you create this new site content type, you can change any of these attributes. The following diagram helps show how content types inherit attributes from their parent content types. 1. This site content type is derived from the System content type. 2. These site content types are based on the Document content type. Any changes that you make to these content types will not affect their parent content type (Document). 3. 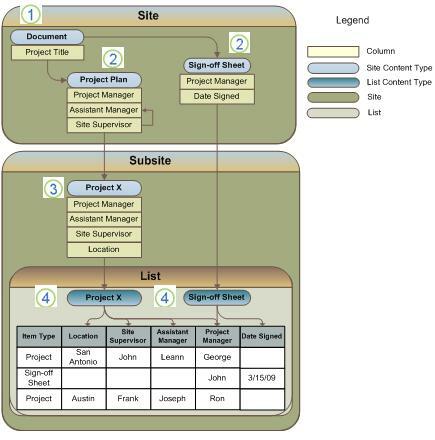 This site content type is based on the Project Plan content type. Any changes you make to this content type will not affect its parent content type (Project Plan). 4. These list content types are based on the Project X and Sign-off Sheet content types. Any changes that you make to a list content type apply only to the instance of that content type that has been added to the list or library. If you customize a child type with attributes that the parent doesn't have, such as additional columns, those customizations aren't written to the parent type. In other words, changes to inherited attributes can cascade downward from parent to child, but never upward. The same rules apply when you create a list content type. For example, if you customize a list type with attributes that the parent type doesn't have, such as additional columns, those customizations don't affect the parent type. Also, remember you can customize a list type only for the list or library to which it was added, and when you change attributes in the parent type, your changes can overwrite the attributes in the child list type. By defining site content types, you can ensure that whole categories of documents are handled consistently across your organization. For example, all customer deliverable documents in an organization may require a specific set of metadata, such as account number, project number, and project manager. You can help ensure that account and project numbers are associated with the customer deliverable documents in your organization by creating a Customer Deliverable site content type that has required columns for these items of metadata. As an example of how content types can help you manage your content, the image below shows the new Customer Deliverable content type as an available option when you create a new document in the Customer Deliverable document library. All customer deliverable document types in the site collection that inherit from this site content type will then require users to specify information for these columns. If you need to track additional metadata that is related to these customer deliverable documents, you can add another required column to the Customer Deliverable site content type. Then you can update all child list content types that inherit from this site content type, adding the new column to all customer deliverable documents. Applying consistent metadata across multiple document libraries is only one benefit of using content types to manage your content. Content types also enable you to associate the same capabilities or attributes to content across your site. If you have a list or library that is set up to allow multiple content types, you can add content types to this list or library from the group of site content types that are available for your site. One of the key advantages of content types for lists and libraries is that they make it possible for a single list or library to contain multiple item and document types, each of which may have unique metadata, policies, or behaviors.